You may want to read the article about different types of plagiarism first. Understanding the various kinds of plagiarism and how to avoid them is essential for academic success and, as the old saying goes, practice makes perfect. Yes, Julie committed plagiarism. She found out that the core idea of her paper was not original or new to her. This can be frustrating when you think you’ve come up with a new idea that hasn’t been written about before. 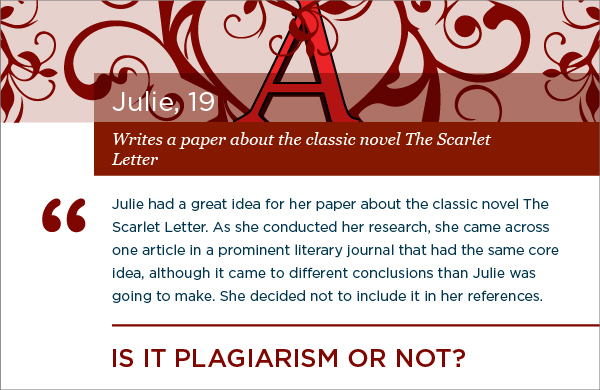 Julie really wanted that idea to be her own, but when she found someone else had the idea first, she should have cited the journal article and mentioned that her conclusions were going to be different from it, especially since the article was from a well-known journal. Whenever you think you have a new idea, you should always carefully research it to find out if anyone else has had that idea as well – chances are good that you’ll need to cite some sources with the same idea.